I graduated from high school in May 1972. By that time, the Vietnam conflict was winding down. In fact, the draft ended in January 1973. The timing was such that I wasn’t directly impacted by the war. I remember seeing images every night on television – both images of the war and images of the protests. But I was not personally acquainted with anyone who was drafted into the military or went to Vietnam as a soldier. 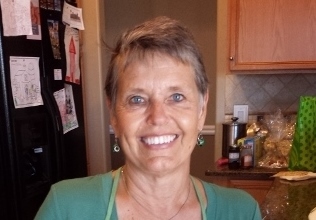 The impact of the Vietnam War was much different for my sister who is five years older than I. She knew people who were drafted. She knew people who went to Vietnam. My only experience was hearing my friends talk about the draft lottery number of their brothers or cousins or acquaintances. Nevertheless, I remember it was a scary time. 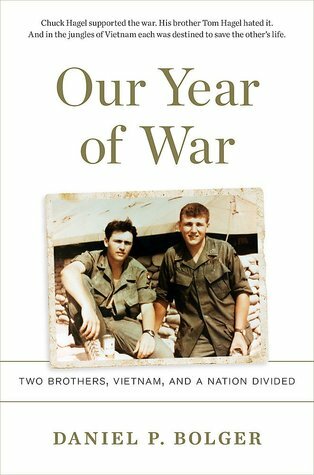 Our Year at War: Two Brothers, Vietnam, and a Nation Divided, by Daniel Bolger, is the true story of two brothers from a small town in Nebraska who fought the war side-by-side, surviving, but leaving Vietnam with two different opinions. I’m not normally a reader of nonfiction, and a book about war would certainly not be of any interest to me. However, the two brothers featured in Bolger’s book – Chuck and Tom Hagel — happened to be from the town where I spent the first 18 years of my life. In fact, both of the boys attended the same small Catholic high school as I, though several years before me. Tom Hagel went to school with my sister. This six degrees of separation caused me to read the fascinating – if horrifying – account of one of the most difficult times in U.S. history. Not only are the stories about the two young men from my home town interesting, but the details about the war itself are riveting. Since the war was still going on, I didn’t study it in school. Film depictions of the war are mostly one-sided and extremely troubling. Bolger provides mostly nonopinionated background as well as very detailed accounts of what brought about the war – which actually started much earlier than I had ever imagined — as well as the battles themselves. The two brothers received extensive military recognition, including purple hearts and the bronze star. They literally served side-by-side, despite the laws which are supposed to prohibit brothers fighting in the same units. They were both injured, and narrowly escaped death on several occasions. They were courageous and dedicated. They, like all of the military men and women who fought in Vietnam, came home to a divided nation. And they were, themselves, divided. One of the brothers went on to become a judge; the other went on to become a United States Senator from Nebraska and eventually the Secretary of Defense in the Obama Administration. I will admit to a fair amount of skimming when it came to some of the details of the war planning. Still, I enjoyed the book very much and strongly recommend it, particularly for anyone interested in this period in US history. I learned so much reading that book and information I’m glad I learned. The dynamic of those brothers going through that war side by side is something my heart will never forget. I’m so proud of the heroes that have fought and still fight for our country.